Braided wire is available in sizes that range from 1/32 of an inch up to three inches wide. Braid can either be tubular or rolled flat. Flat braids are typically used for flexible connections, electrical leads and grounding straps while tubular braids are usually used as shielding around other cables. Tinned copper, Nickel Plated Copper and Sliver Plated Copper Braid are available in rolled-flat or tubular form and many sizes conform to QQ-B-575 & A-A-59569 specifications. Stainless Steel Briad is available in tubular only. Minimum website orders are 100 feet. Please call to order smaller quantities. For each product please see the link below for detailed specifications and pricing. Daburn has identified Daburn equivalent products for most NSN Braids. See the link below for a listing of NSN numbers and the equivalent Daburn products. Tinned copper shielded braid manufactured round per Mil Spec QQ-B-575 and A-A-59569. Used in military and commercial applications where maximum shielding is required against electrostatic interference. Also Useful against mechanical abrasion and stresses. 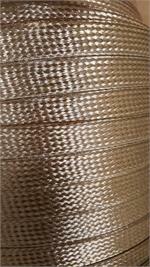 Woven Nickel Plated Copper shielded braid manufactured round per Mil Spec QQ-B-575 & A-A-59569. Individual wire strands have 50 micro-inches of nickel plating over copper meeting ASTM B355. Recommended for high temperature applications up to 400°C. Woven braid made from soft drawn stainless steel alloy 304. Provides corrosion resistance and good overall mechanical covering. Stainless steel alloy 430 (magnetic) also available. Woven Nickel Plated Copper braid rolled flat at manufacture per Mil Spec QQ-B-575 & A-A-59569. Individual wire strands have 50 micro-inches of nickel plating over copper meeting ASTM B355. Recommended for high temperature applications up to 400°C. Woven silver plated copper braid rolled flat at manufacture per Mil Spec QQ-B-575 & A-A-59569. Individual wire strands have 40 micro-inches of silver plating over copper meeting ASTM B298. Use silver plating, subjected to temperatures exceeding 150° C.
Tinned copper shielding flat braid manufactured round per Mil Spec QQ-B-575 and A-A-59569. 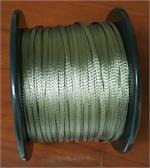 Soft annealed tinned copper braid tightly woven, rolled flat at manufacture, extremely flexible. Useful as battery grounding or bonding strap.